The late 1970's was a time of great turmoil and rampant innovation in Formula One. Soon after the adoption of spoilers, Lotus made a quantum leap with the ground-effect 78 and 79, which were challenged by the equally innovative Brabham BT46B “Fan Car”. While all this aerodynamic witchcraft was being practiced, Renault blasted onto the stage with a technological breakthrough that would define an entire era. 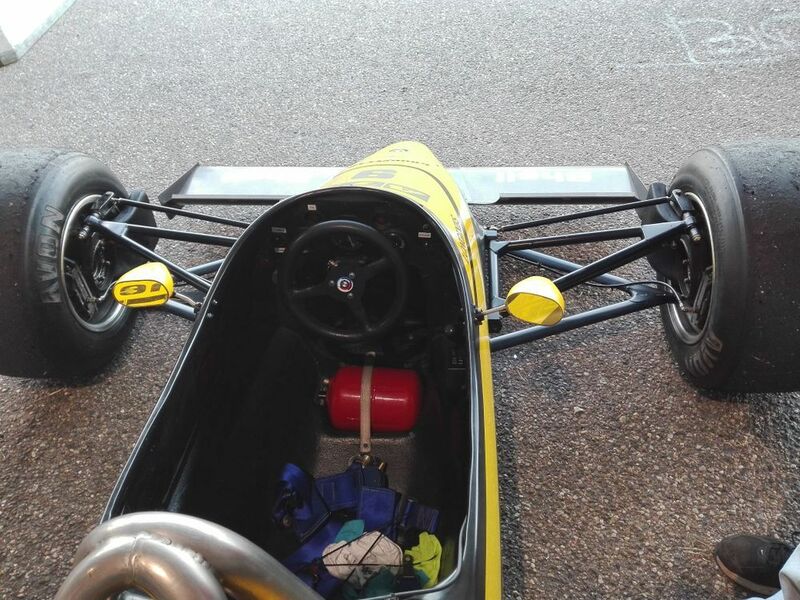 With the bulky, ever-evolving RS01 as a racing testbed, the French company had developed the first turbocharged Formula One car. The unreliable car was laughed off at first, but soon enough the RS01 was refined into an effective high-powered killing machine. The twin turbo RS10 followed in 1979, but it took until 1981 for Ferrari to respond with the 126CK. Just a year later, Brabham team boss Bernie Ecclestone managed to lure in a third turbo manufacturer: BMW. Like the early Renault’s, that year’s BT50 was unreliable, but ridiculously fast. Auto Technisches Spezialzubehör’s main business was the manufacture of alloy sporting and racing wheels, but owner Günther Schmidt had steered the company into F1 after buying the remaining Penske PC4 chassis in 1977. In that first year, the team’s main claim to fame was the incident at Hockenheim involving touring car ace Hans Heyer (GER), who managed to fail to qualify, fail to finish, and be disqualified all in one race. Hans Heyer preparing for his infamous stunt, Hockenheim 1977. In the years that followed, ATS switched between running a one and two car effort twice as the budget fluctuated up and down. More worryingly, the team went through 14 different drivers between 1977 and 1982, due in no small part to Günther Schmidt’s temperamental and unpredictable management style. Schmidt feuded with original driver Jean-Pierre Jarier (FRA), and was known to completely change the direction of the team and fire drivers on a whim. Part-time session drummer Slim Borgudd brought in endorsement from a rather flamboyant sponsor: Swedish superstars ABBA. As a result, Hans Binder (AUT), Jochen Mass (GER), Alberto Colombo (ITA), Keke Rosberg (FIN), Harald Ertl (AUT), Hans-Joachim Stuck (GER), Marc Surer (CH), Jan Lammers (NED), Slim Borgudd (SWE) and Eliseo Salazar (CHI) all took the wheel in haphazard intervals. The lack of a stable driving team meant March-designer Robin Herd could do little to accurately develop the cars, resulting in lackluster performance and appalling reliability. Schmidt's deal with BMW gave ATS a massive gain in performance. Despite the squad’s extensively chaotic past, 1983 was supposed to be the turning point. Günther Schmidt’s excellent connections in the German automobile industry gained him an audience with BMW, resulting in a relatively exclusive supply of the now very competitive turbocharged M12/13 1.5L four cylinder engine. The one and only reason for the BMW's prowess. This little monster actually date back to 1961, when it started life as propelling humble family runabouts like the 1502. However, under the expert guidance of BMW Motorsport’s engine wizard Paul Rosche and his team of top engineers, the engine was transformed from an 80 horsepower weakling to a 640 horsepower juggernaut thanks to a massive Künhle, Kopp & Kausch turbocharger. This gave ATS 120 horsepower more than its privateer competitors running the ubiquitous Cosworth DFY 3.0L V8, and put it on par with Ferrari and Renault. Such unbridled power deserved a competent chassis, so ATS hired experienced Austrian designer Gustav Brunner to draw up a carbon-fiber monocoque. Brunner’s main challenge was incorporating the tall and unwieldy BMW-engine, as its layout made it impossible to use it as an integral part of the chassis. To deal with this problem, he was forced to design a separate subframe to provide a “cradle” for the M12/13. A modified Hewland five-speed manual gearbox transferred the fury to the rear wheels. Suspension consisted of double wishbones and coil springs on all four corners, with just 540 kg (1190 lbs) of weight pushing down on them. Winglets were introduced to try and claw back some downforce. Apart from the turbo engine, the biggest difference from 1982’s D5 chassis was the absence of a ground-effect underbody, since the technology had been banned before the start of the season. Flat floors were made mandatory instead, which forced ATS to revert to using a front wing again to compensate for the loss of downforce. Secondly, the D6 sprouted winglets beside the main rear wing, which enabled the team to skirt around the maximum wing width regulations. If anything, the lack of ground effect leveled the playing field, since only the top teams actually had the manpower and budget to correctly implement it. For the third time in its short life, ATS slimmed down its involvement in Formula One to a one-car effort. German Manfred Winkelhock was retained from his 1982 drive, while his former teammate Eliseo Salazar dropped out due to an economic crisis in his native Chile. 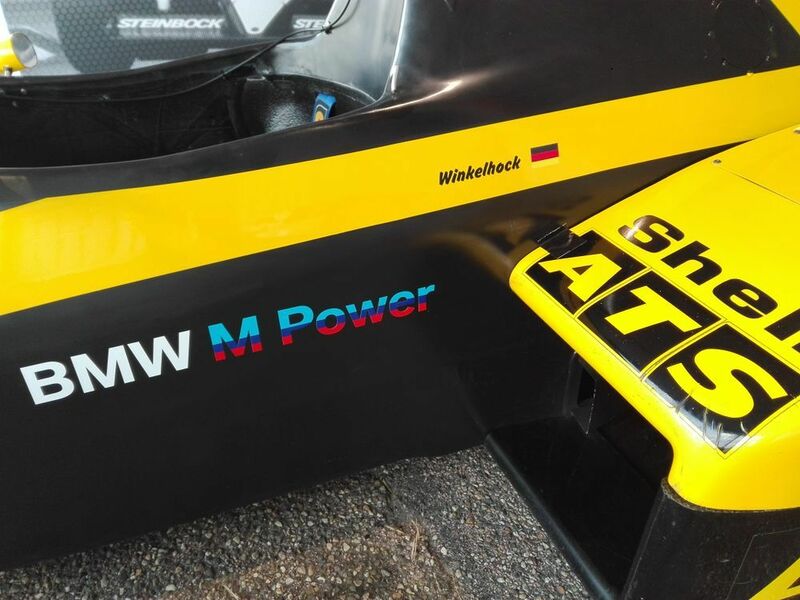 Winkelhock enjoyed a good relationship with BMW, as he had been powered by them in his Formula Two career. This made him the perfect fit for the revamped ATS. Manfred Winkelhock spearheaded the ATS effort for 1983. Winkelhock and the D6 would get their first taste of competition at Jacarepaguá, Brazil. There, the pair would face off against five other turbo teams: Ferrari, Renault, Alfa Romeo, Brabham, Lotus-Renault and Toleman-Hart. Together, the thirteen turbo cars were clearly starting to threaten the 15-car exclusively Ford-Cosworth-powered majority from McLaren, Tyrrell, Ligier, Williams, Arrows, RAM, Theodore and Osella. Despite turning up the engine to its 750 horsepower qualifying trim, Manfred Winkelhock was unable to overpower his competitors on the swooping track. The savage power delivery and monumental turbo lag made life very difficult in the ATS. His best time of 1:41.143 was only good enough for 25th place, 6,627 seconds behind pole-sitter Keke Rosberg and his Williams. Race day was no more successful, as the D6 was classified 15th and last, 4 laps down on race winner Nelson Piquet (BRA) in the Brabham BT52. At the first of the season’s American rounds, the US GP West on the streets of Long Beach, California, Manfred Winkelhock clocked the 24th fastest time, 4 seconds down on Ferrari’s Patrick Tambay (FRA) on pole. Sadly the adventure lasted just three laps, as Manfred spun into retirement. For the French Grand Prix at Paul Ricard, the prospects were a bit more positive. The track featured the car-breaking 1.8 kilometer Mistral Straight, which heavily favored the vastly more powerful turbo cars. As a result, Winkelhock joined the rest of the blown machinery in the top 11, even managing to beat Patrick Tambay for 10th place. Unfortunately, his turbo quickly turned on him, blowing to pieces on lap 36. ATS was still unable to keep up with the rest of the turbo field. Following the two high-speed tracks, ATS faced the challenge of Monaco. The incredibly tight street circuit favored handling, drivability and throttle response over everything else, which put the team at a huge disadvantage. The BMW-motor provided tremendous motivation at full chat, but in slow corners the turbo lag was simply disastrous. It could take several seconds before the boost would kick in, leading to Winkelhock adopting the peculiar habit of mashing the throttle immediately after releasing the brakes to get the power on exactly when he needed it. This strategy worked to an extent. Manfred found himself 16th on the grid, .3 of a second ahead of Riccardo Patrese (ITA) and his Brabham-BMW. All that work turned out to be for nothing however, as he was taken out by a collission with Ligier’s Raul Boesel (BRA) on lap 3. At the blindingly fast Spa Francorchamps circuit, the D6 was back in its comfort zone. Another 7th place on the grid equaled the high water mark of Imola. A loose wheel at the very quick Pouhon corner ended the party prematurely however, as Winkelhock violently span into the armco. Further exacerbating the situation, he had been running in a point-scoring 6th place, but lap 18 would be his last. 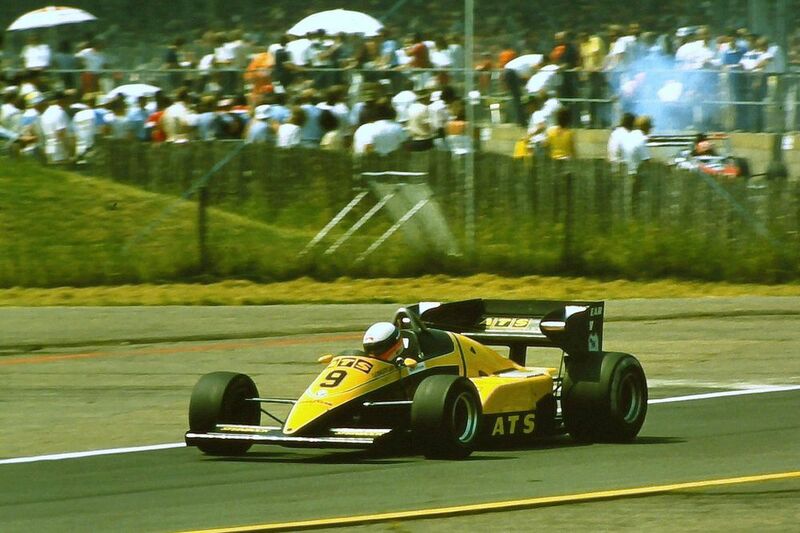 On the tight street track of Detriot, the ATS was once again hopeless, leaving Manfred Winkelhock 22nd. ATS wrote up another DNF after the German crashed on lap 26, leaving the team completely pointless after seven races. The long straights at Circuit Gilles Villeneuve gave the BMW-engined D6 a competitive edge once again, and Winkelhock secured his third 7th place start of the season. He dropped back on race day though, eventually securing a 9th place, three laps down on winner René Arnoux. Eighth place on the grid was another good result for the team at the fast Silverstone circuit, showing the car could only really keep on when absolute power was the biggest factor. Sadly the adventure lasted only 49 out of 67 laps, as the BMW-engine called it quits for the day after overheating. ATS lost a big opportunity for the German Grand Prix, as the D6 never met the exceptionally long straights of the dizzying Hockenheimring. Technical problems prevented Manfrewd Winkelhock from setting a time in qualifying, which denied him a race start. For the Austrian Grand Prix, Winkelhock qualified 13th. The unruly car struggled in on the swooping circuit, leaving it little room to exploit its massive power. Further problems occurred on race day. A water leak spelled the end for another M12/13, leaving Manfred stranded by the side of the track. A new challenger arrived at Zandvoort, with McLaren debuting the new Porsche-developed TAG TTE P01 twin turbo V6 in a modified MP4/1. The engine was still experimental though, leaving the front runners with little to fear. 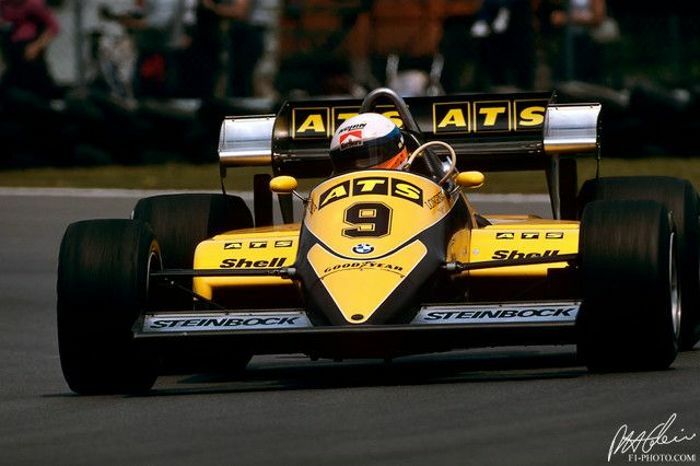 The long straights of the Dutch venue propelled Manfred Winkelhock to a solid 9th place on the grid. The German wouldn’t be able to do much racing however, as he inexplicably overtook Riccardo Patrese on the formation lap, netting him a swift disqualification. 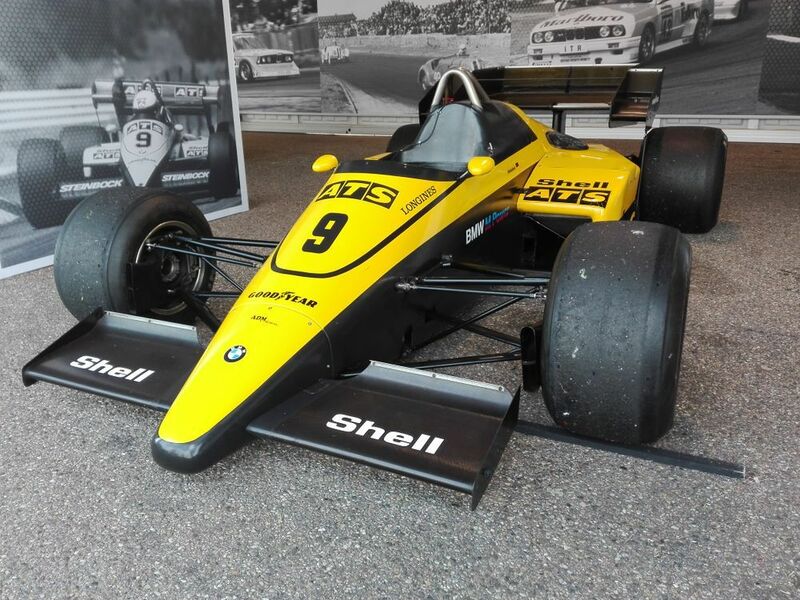 Manfred Winkelhock made a bizarre spectacle of himself at Zandvoort. The Temple of Speed at Monza was perfectly suited to the ATS, but Alfa Romeo had improved its 183T, leaving Manfred Winkelhock to take 9th once again. Thirty-five laps into the race, the car’s exhaust broke. ATS had the speed to challenge the bigger teams, but it was clear it still lacked any and all reliability. 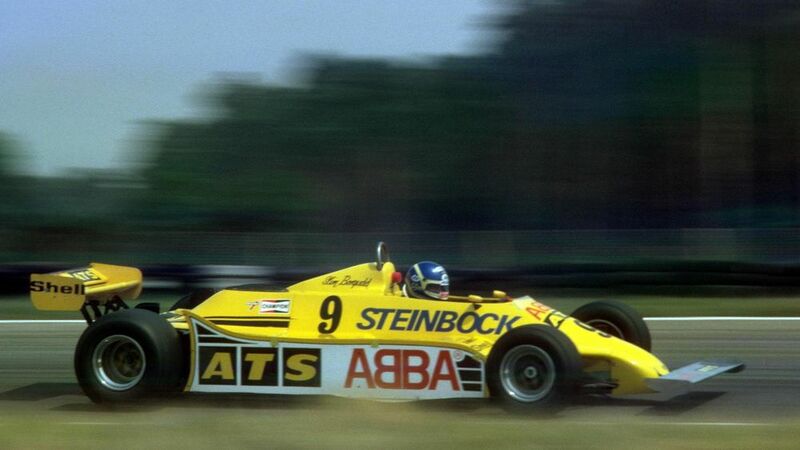 Manfred Winkelhock maintained his top 10 pace with another 9th place at Brand Hatch, a track which didn’t particularly suit the ill-handling D6. Winkelhock’s skill, determination and perseverance were finally rewarded with a top 10 finish, as the German scraped in an 8th place finish, a lap down on Nelson Piquet. Sadly, points weren’t awarded below 6th place, but the team had finally made a mark at the second to last Grand Prix of the season. Manfred Winkelhock on run up to Druids, Brands Hatch 1983. The final round of the 1983 Formula One World Championship took place at another high-speed venue. 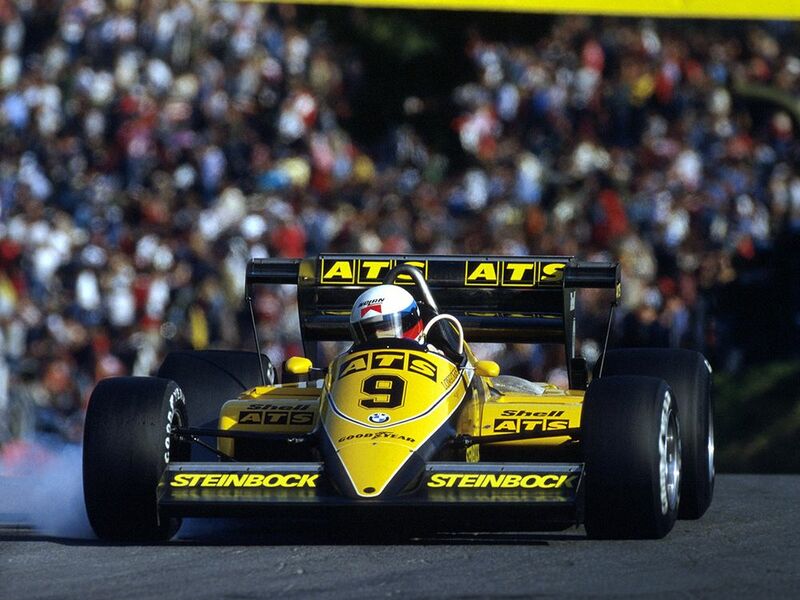 South Africa’s Kyalami sported one of the long straights ATS loved with a furious passion, which resulted in Manfred Winkelhock taking 8th place in qualifying. Unfortunately, the D6’s final race ended in disaster. Already on the opening lap, the BMW engine failed in a big way, giving Winkelhock an early and very well-deserved vacation. One of three ATS D6's at the 2017 Zandvoort Historic Grand Prix. The ATS D6 was a struggling small teams first attempt at challenging the big boys. Powered by one of the most competitive engines in the field, the car was meant to be a giant leap forward. Sadly, the team struggled to get to grips with the powerful but temperamental BMW-engine, as its overpowered the bargain-basement chassis. On top of this, the car’s reliability record was at best appalling. 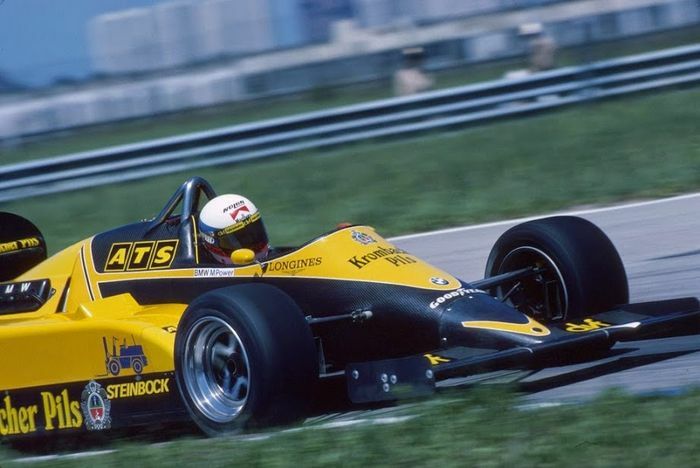 Despite the many woes, the team seemed to stabilize in the latter races of the season, helped by the skill of driver Manfred Winkelhock. With nowhere else to go, he would remain with the team for 1984 to drive the new D7, as Günther Schmidt stubbornly pressed on with his overly-ambitious F1-project.